VATICAN CITY (CNS) — The Vatican secretary of state said he expects Pope Francis to visit New York City and Washington, D.C., during his September trip to the United States. 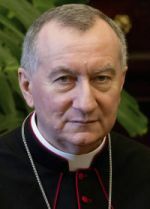 Cardinal Pietro Parolin, who as secretary of state is considered the highest Vatican official under the pope, spoke to reporters Jan. 6, following a ceremony to dedicate a new building at the Pontifical North American College, the U.S. seminary in Rome. In November, Pope Francis confirmed reports that he would attend the World Meeting of Families in Philadelphia in September. So far, that is the only confirmed stop on what is expected to be a more extensive papal visit to North America. The pope had already acknowledged receiving invitations to Washington from President Barack Obama and the U.S. Congress, and to New York from the secretary-general of the U.N.
Cardinal Parolin was also asked about the pope’s decision not to create any U.S. cardinals at a consistory Feb. 14, where most of the 15 new cardinal electors will hail from developing countries in the global South, including several that have never been represented in the College of Cardinals.